Belgian one-man ambient/post-rock act Stratosphere (Ronald Mariën) returns with a remarkable album. Aptly titled ‘Collaborations I’, the new full-length features a plethora of colleagues, including Dirk Serries, Aidan Baker, Karen Willems, N and Ashtoreth. The result is a brand new Stratosphere, the one that dares to explore and experiment. ‘Desolation’, known from the 2016 album ‘Rise’ received a makeover with live drums by Inwolves drummer Karen Willems. The other eight tracks are newly composed duets, opening with a cooperation with shamanic drone ambient guru Ashtoreth. 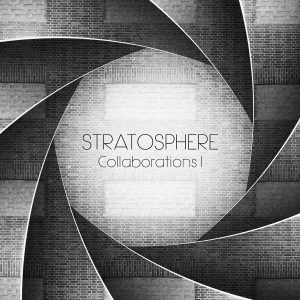 On ‘Collaborations I’ you can hear Stratosphere open up and find new waves to express his creativity. A varied and immersive album on which Ronald and his friends explore downtempo electronics, drone ambient, jazz, noise, post rock and classical music. Drums, saxophone, bass guitar and piano enhance Stratosphere’s soundscapes to create whole new musical landscapes. In his music project Stratosphere, guitarist Ronald Mariën, creates loop and effect heavy music that drones and burbles, tinkles and undulates, as if acknowledging the fragility of the state it offers. With his album Collaborations I (72’28”) he pairs off with nine other musicians to produce as many tracks in a distinctive range of new music. Mariën provides each collaborator with an atmosphere over which they may lay their signature sounds – each adding something to the effort that Mariën cannot conjure on his own. As ghostly assemblages of drifting guitar textures meet muted synthetic harmonies, we might zone out through whole songs at a time – only to become startled by some pristine sonic detail buried in the mix. In the restless surge of advancing tones the listener may find strength in the stillness – just as easily as the next track unleashes a lava-hot guitar drone “deal-with-it” drum jam. While some efforts do take the ear strangely, Collaborations I also provides enough reassuring ambient thought zones to color the listening space with familiar tones and warm temperatures. In the movement of these masses of sound, and the resulting radiant, translucent conditions, we find a certain comfort in all the openness, space, possibility and even the danger – as each track struggles for its own unity and cohesion.